For those who spend a lot on purchasing daily items, saving money is a wise idea. Among many money-saving apps, Ibotta is the best one for everyday use. You would be thinking why shouldn’t you start couponing instead but they take too much time. After reading many Ibotta reviews online, we are convinced to use it all along the way. Earn cash back for your purchase every time you shop through Ibotta. It is a free app and will completely change your life once you start using it. You can download the app on all types of iOS and Android smartphones. Ibotta has at least 300 different stores from grocery and convenience stores to clothing stores and restaurants at any given point of time. It also consists of home improvement stores and pharmacies along with online stores. You can check which stores are offering cash back before you go shopping to make the maximum of the opportunity. For example, Cost Plus World Market was running a cashback offer of $5 on every $30 spent. They have a lot of discounts all the time but keep an eye during the holidays. Groupon had a 40 percent cashback offer on photo canvases, which you could give as gifts. If you want more cash back, make groups on Ibotta, so your entire team can get additional offers. Ibotta not only helps to save money but also save time you spent to go from one store to another to find a good deal. Make sure to collect the receipts of the places you shop and eat and upload them at the end of the day. Launched in 2011 by Bryan Leach, Ibotta is one of the few cash back apps that offer rebates and cash back on alcohol including spirits, beer, and wine. However, you need to prove that you are of legal drinking age, even if you won’t be drinking it yourself. In July 2016, Ibotta revealed that they had paid over $100 million in cash backs and rebates. Currently, the cash back app works with over 500,00 stores across the United States. Make sure you have a Venmo or PayPal account before you download the app. Ibotta offers “any brand” cash back almost every day. It means that you will get cash back on any brand you shop at any store. Even though, the cash back is only around $2 a week, it comes up to $104. Any savings is good savings. Ibotta offers the best cash back offers on fresh meat, fruits, and vegetables along with cheese and yogurt. Even if you get a $5 cash back a week, you save another $260 a year. When you use a mailer coupon, you cannot combine two deals together. With Ibotta, it is completely possible. For example, if you are shopping at Target and get 30 percent discount on a vacuum cleaner, you can scan the bill and get cash back on the product. You can save on unique products like alcohol, which is something difficult to find. Use the barcode scanner to check what brands are offering rebates or cash backs. After looking at the attractive deals, you are motivated to purchase something you don’t want or need. And not too long later, you start regretting about the decision. It is a good thing that it makes you try new things but it can be bad if the product doesn’t turn out to be good. You have no choice but purchase the product that you have been using all this time. The app is designed for your convenience but notifications of only the nearby stores limits your options. You might be going downtown for a party and you would have planned to shop a few things on your back home but because you couldn’t find discounts, you have to go to your local store. 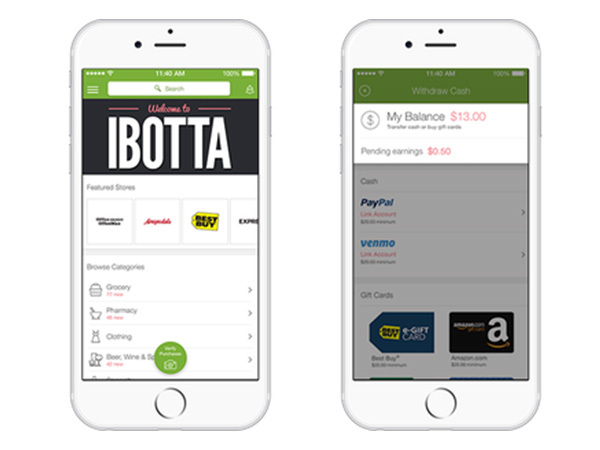 If you want to shop online, you have to shop through the Ibotta app. With Ibotta, shopping online on a computer is difficult. Download the Ibotta app on your Android or iOS smartphone. Sign-up to create an account. We recommend you to make two shopping lists — food and non-food. It becomes easier later when you have to find deals later. Write down the brand next to the item if you are interested in buying from a particular brand. Ibotta releases new cash back offers every Thursday, so go shopping on Friday to get the best deals. Open the Ibotta app on your mobile phone and take a look at offers available on your nearest superstores. Make sure to check the stores that you rarely visit because sometimes Ibotta has offers only in one or two stores. Check the What’s Hot and What’s New categories. Don’t spend more than five to eight minutes on this. Whenever you find a rebate, add it to your rebates list on Ibotta. Sometimes a few ads pop on the screen but while they play, you can get some other work done. Make sure to hit the Unlock button every time you add a new rebate. This is the most fun part of the process. You would be lying if you say you don’t find shopping therapeutic. If you couldn’t find all deals at one store, you might have to go to a couple more. You don’t have to do anything differently while shopping. Once you are back home and put the groceries in the refrigerator and the pantry, open the store you shopped from and click on the Verify button. You also have to upload the barcode of every item you purchasing excluding a few fresh produce. After you are done, upload the receipt or scan the barcode on it. The cash back will be added to your account in the next 48 hours. To transfer the money to your bank account, link the app with your Paypal or Venmo account. You can also opt for a gift card, which you can use the next time you go shopping. If Ibotta doesn’t have good discounts in your area, we have an alternative that you can use. It is called Cashbackbase and works just like the famous rebates app. It is a point-based site, which offers up to 100 percent cash back as rewards. Cashbackbase has its own shopping portal with attractive discounts and a chance to earn points that you can redeem any time you want. The cashback site only offers discounts on Amazon products, so you can purchase anything on the eCommerce website from the comfort of your home and win free goodies. After you qualify for a 100 percent cash back offer, you have to purchase the product on Amazon. Then, you have to send your order details of Cashbackbase, who will refund the money to your PayPal account. The claim is only active for 30 minutes after purchase, so make sure you don’t cross the limit. Also, the cashback deals are only available for a limited time. In case your deal request fails, it means all the available slots got filled. The points that you earn on your purchases are only valid for up to seven days from your last login, so manage your shopping schedule accordingly. Whatever cash back you receive will always be slightly lower than the amount displayed because all transactions take place via Paypal for which you have to pay a charge. Ibotta has become our favorite for in-store shopping. Whether you want to fill in the weekly groceries or buy gifts for Christmas, it will help you save some extra bucks. You can use that money to buy groceries or put in your savings for the Hawaii trip you are planning for so long. 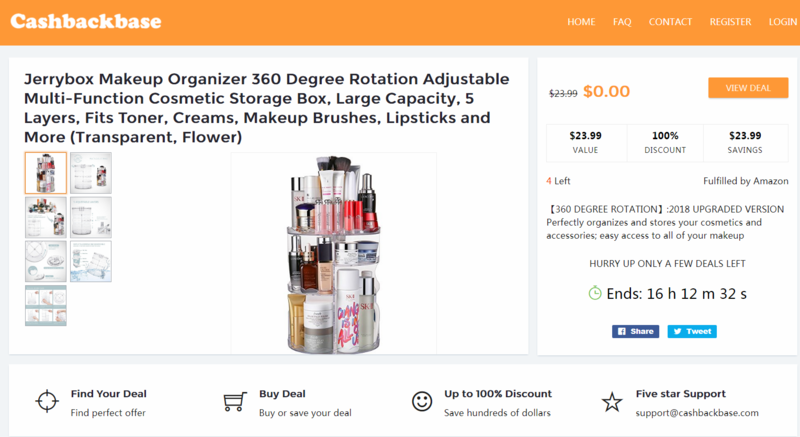 If you love Amazon and purchase most of your daily use items from here, you will love Cashbackbase. It is a point-based site that offers up to 100 percent discount. What are you waiting for? Put on your shopping boots and enjoy the therapy.